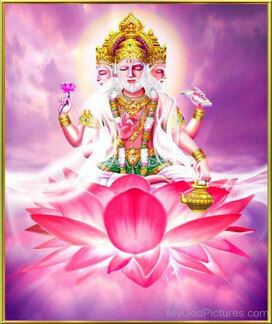 Lord Brahma, the designer of the Universe, is always depicted as sitting on a huge lotus and holding one in his hand. 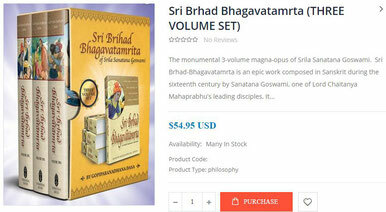 Another name for Lord Brahma is Kanja or the one born out of the water. Brahma was born from the navel of Lord Vishnu while others say that he was born from a huge white lotus that we call the Brahma Kamal. The Life Giving Lotus: The story of the birth of Ganesha is a popular one. When Shiva attached the head of an elephant on Ganesha' s body, he was bathed with water that was sprinkled from a Brahma Kamal. That is why this lotus is given the status of a live-restoring flower of the gods. To evaluate it in terms of modern science, this flower has many medicinal properties. 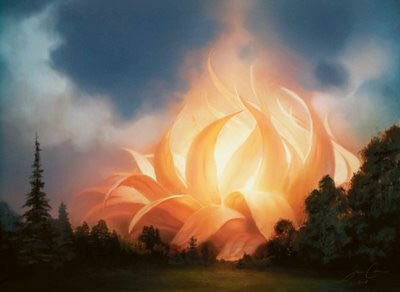 The Golden Lotus: When the Pandavas were in exile in the forests, Draupadi accompanied them. She was constantly tormented by painful memories of her insult in the Kaurava court. The hardships of a forest life also took its toll on her. One evening she saw a beautiful lotus float away in the stream. After she saw this 'golden' lotus bloom, she felt a strange happiness that was almost spiritual. But the lotus withered as quickly as it had bloomed. 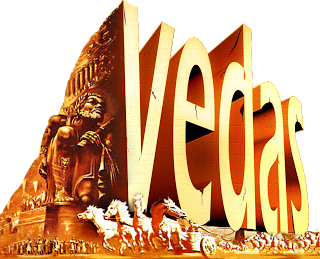 Draupadi sent her most devoted husband Bhima to look for it and on his quest for the flower he met Hanuman (Bhima's elder brother). As a lotus is usually pink, 'golden' may mean a shimmering 'white'. This story too is a reference to this mysterious flower. Wish Fulfilling: It is long held belief that anybody who sees this rare flower blooming will have all his or her wishes fulfilled. It is not easy to watch it bloom because it blooms in the late evening and stays only for a couple of hours. Also the fact that it is supposed to bloom once in 14 years makes it a very rare sight. The Brahma kamal is supposed to grow in the highest parts of the Himalayas and that holds true even today. This flower indeed grows in the Himalayan forests. 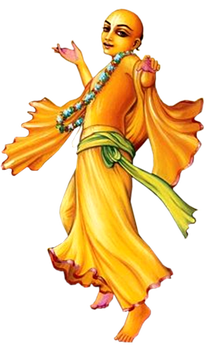 There are several other references to this mythical flower. Here are some of the most important ones. The symbolism of the lotos shows the unfoldment of the inner divine potential, and two parallels between spiritual and physical planes --- between cosmic creation and spiritual rebirth. Because its seed already has within it perfectly formed embryo leaves and whole plantlets -- even to the flowers -- this water lily symbolizes the recalling of the universe from the Eternal at the beginning of a great solar cycle. The lotus is called "the child of the Universe bearing the likeness of its mother in its bosom,"
Moreover, because it has buds, blossoms, and seed pods simultaneously on the same plant, it has symbolized the past, present, and future. The ancient Egyptians and Indians noticed that the lotus responds to the presence or absence of light and warmth, submerging itself by night and rising from the water at dawn, symbolically "worshiping the sun." This sun-loving habit made it a symbol for Horus, the Egyptian Christ/Krishna figure, born of the waters of creation. The sun god Ra rises from the blue lotus, as in the primordial cosmogony when he rose from Nun, the abyss of the chaos. The sun disk of Ra/Horus was hidden by the lotus's enclosing petals; when they opened, the sun rose and flew out in the form of a child wearing the solar disk on his head. The Papyrus of Ani describes the deceased actually turning into a lotus in order to be like Ra and Horus, with a renewed body to enter ``heaven'' day after day. (The Book of the Dead, tr. E. A. Wallis Budge, p. 310) Egyptians, Hindus, and Buddhists had private lotus gardens where priests daily reenacted creation's first sunrise. The lotus also appears in India in Hindu accounts of creation. In one version, after the utterance of the first Om, the vast primordial ocean brought forth "a wondrous golden lotus, resplendent as the sun, which floated upon the lonely waters." 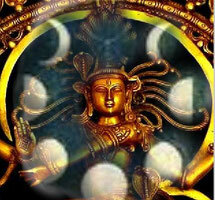 From Om issued the Hindu trinity of Brahma, Vishnu, and Siva, who are represented seated on golden lotuses. This picture recalls the creation process where the dry land emerged from an ocean of milk in a churn placed on the tortoise of the world. Another Hindu version of creation portrays the emergence of the heavenly man, Purusha, from the mundane egg which grew about him after "desire first arose in It," thrilling life through the sleeping spaces to create the first differentiation. 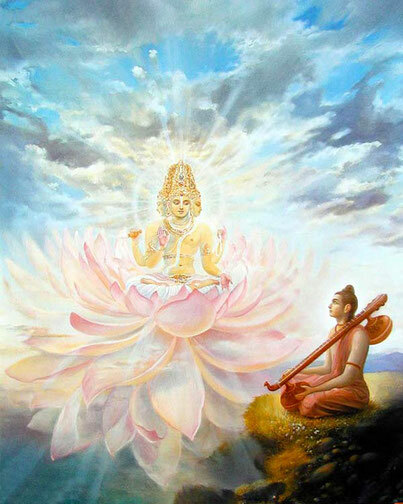 The creation of Vishnu followed: he slept on a lotus, and a lotus stem issued from his navel. The waters are the womb of space and the stalk is the umbilical cord. 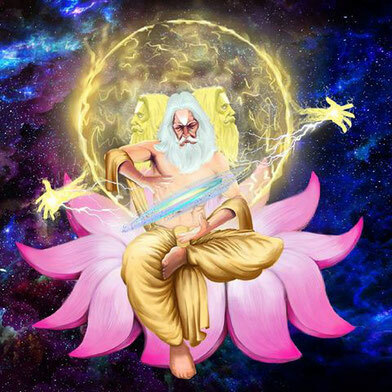 From this lotus grew Brahma, the creator, who seated himself in the natal position on the lotus, contemplating the eternal, thus dispersing darkness and opening his understanding. Then he began his creative work as demiurgos, an act which comprises the efforts of heat and water (spirit and matter) in relation to the mundane and divine creators. This may be why Hindus use the lotus to represent nature's productive power working through the agency of fire/water or spirit/matter. Lotus is the symbol of learning and cognitive thought. Lotus flowers mean purity of speech, mind and body rising above the waters of desire and attachment. The lotus is one of the Eight Auspicious Symbols. Different colors of lotus are symbolically used to represent aspects of perfection. There are four colors, which are pink, blue, red and white. 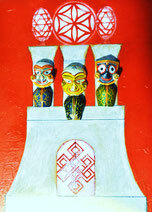 Red represents the heart--its purity, original nature, compassion, passion, love and other qualities. White symbolizes spiritual perfection and complete mental purity. Pink represents the Buddha and is the supreme lotus. Blue means wisdom, knowledge and victory over the senses. Ein Goldener Lotos entspringt dem Nabel Vishnus. Dieser entspricht der gigantischen universalen Form. Brahma das erstgeborene Lebewesen erscheint und wird sich langsam seiner Position bewusst.